The curious Victorian age was named for England’s spectacular Queen Victoria. She took the throne in 1837 and died on January 22, 1901. Victoria’s husband, Prince Albert, died of typhoid in 1861. During this curious period of forty years, the Queen was in mourning… for all forty years! She remained in full mourning for three years and dressed the entire court that way. The Victorian era reflected the Queen’s prudish ethics as well as, most visibly, her curious personal taste in mourning. Though hair art has been around for centuries, for many Victorians, the wearing of a loved ones hair kept their memories fresh for the wearer. What started as a curious way to keep a loved one near became an elaborate art practiced by many. Many people today believe that hair jewelry was made only for the purpose of remembering a deceased loved one. 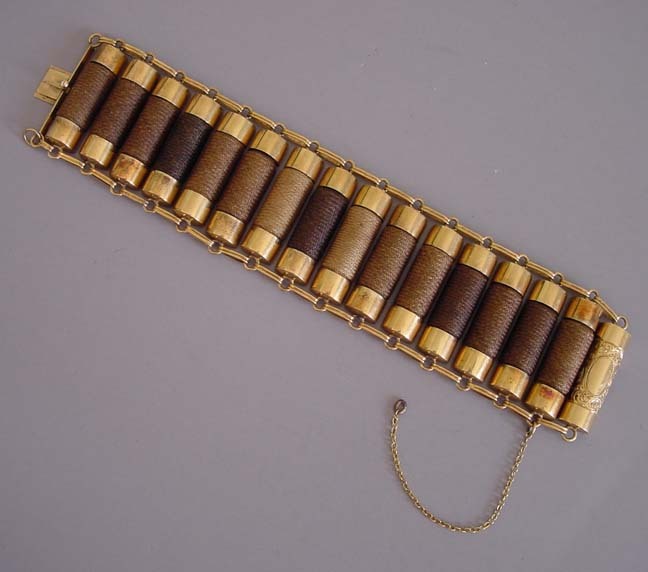 While that was one function of hair jewelry, many pieces were also made for sentimental reasons, as tokens of affection. It is written that she wore a piece of jewelry made with Prince Albert’s hair every day after his death. Because of Queen Victoria’s influence the fashion of wearing mourning jewelry lasted until the end of the 19th century. 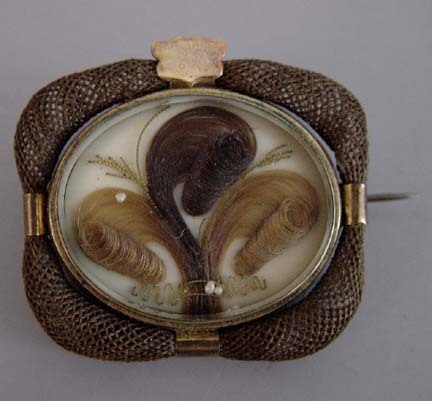 Taking a lock of hair and weaving it into knot designs for use in a broach was the most popular form of Victorian mourning jewelry. 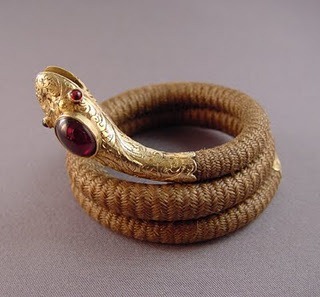 Rings, bracelets, earrings, and necklaces all became quite common in the later portion of the century. Queen Victoria herself gave pieces of jewelry made from her hair as gifts, many of these pieces were given to her children and grandchildren. 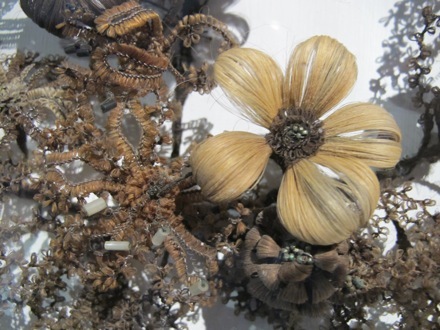 Hair art comes in a variety of sizes and designs which include acorns, wreaths, and ornate framework. 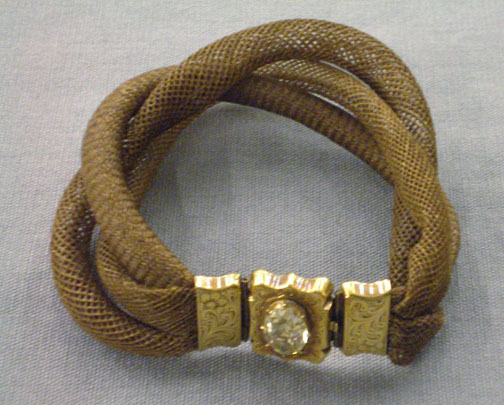 A bracelet made of human hair. Both were woven with painstaking delicacy! Sadly the true history behind most hair art remains cloudy since they pass between so many hands…or in this case wrists. 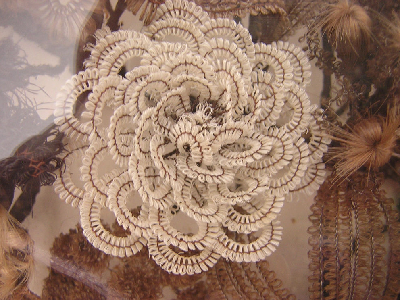 A beautifully ornate broach curled to resemble flora. It was socially important to wear these when in mourning inVictorian times since there was such a strong social protocol for especially the upper and middle class. They had a different mentality when it came to death. It was part of everyday life and was treated with respect. 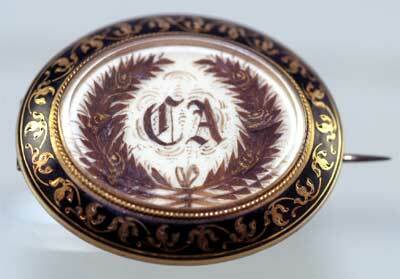 Wearing your loved ones initials was also a very popular hair art design. Just look at how ornate the laurel leaves are!! Though hair art itself is considered artwork, some pieces were created as actual works of art meant to be displayed in the home and not worn. So intricate are some of these that from a distance one might curiously think it was a real flower set of a small statue made of a far more sturdier material! If you look hard enough you can see the thin strands of hair! In all my travels, this must be one of the most creative and beautiful ways to remember someone…dead or alive!